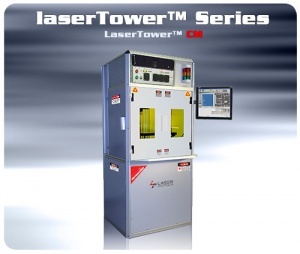 The LaserTower™ Series are the most versatile industrial-grade 3D laser marking, laser etching, and laser engraving material processing systems in the industry. The LaserTower family is designed to perform under high-vibration, shock and dust conditions. Each LaserTower™ system is optimized for our customers based on their unique material processing application. All Direct Parts Markings (DPM) are permanent, legible and non-removable across the largest range of materials with special attention to highly-reflective metal applications. 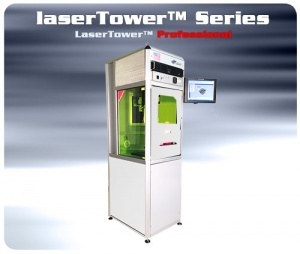 The LaserTower™ Professional 3D laser marking and laser engraving machine is an industrial-grade cutting-edge material processing system that operates in a small 2ft by 2ft space saving footprint. 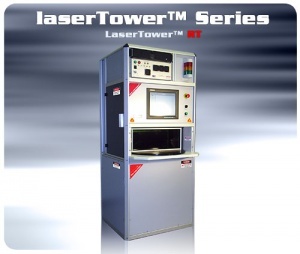 The LaserTower™ Professional Round-Table (RT) 3D laser marking and laser engraving machine is an industrial-grade material processing system engineered to operate in a continuous production environment. 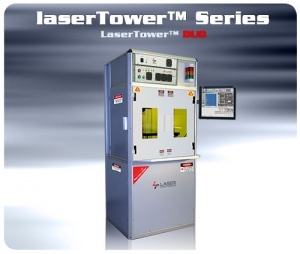 The LaserTower™ Professional DUO 3D laser marking and laser engraving machine is an industrial-grade state-of-the-art material processing system that combines the benefits of both a Fiber laser and CO² Laser to process any material. 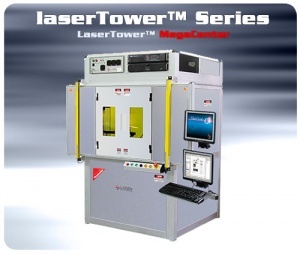 The LaserTower™ Professional MegaCenter™ 3D laser marking and laser engraving machine is an industrial-grade high-volume manufacturing system utilizing the company’s proprietary Zero-Friction Direct Drive Motion System. 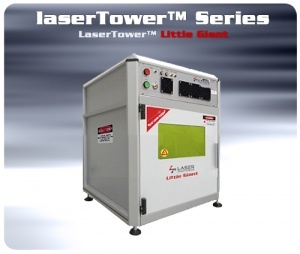 The LaserTower™ Little-Giant 3D laser marking and laser engraving machine is a low-cost commercial-grade material processing system designed for low-profile flat marking applications and very small size for the tightest workspace conditions. 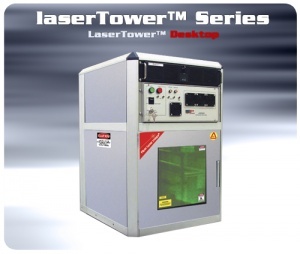 The LaserTower™ DeskTop 3D laser marking and laser engraving machine is an economical industrial-grade material processing system designed for low-profile flat marking applications and small size for tight workspace conditions. 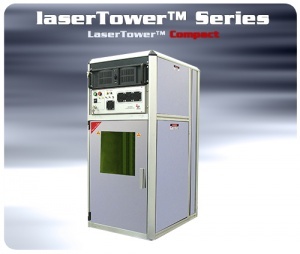 The LaserTower™ Compact 3D laser marking and laser engraving machine is an agile industrial-grade material processing system that operates as a stand-alone system or easily integrates into a crowded I/O production line environment.